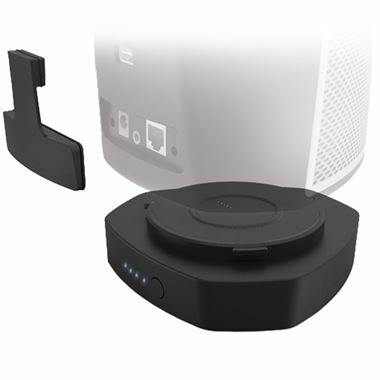 Denon HEOS GO Pack includes Battery & Splash Guard for the HEOS1 Wireless Speaker system. The Denon Heos Go Pack is the perfect companion for the Heos 1 wireless speaker. Now you can take it with you wherever you go. Including a battery with 6 hour life and a splash guard to protect the input terminals so you can stream your music anywhere, with ease, this is essential to make the most of the Heos experience. The Lithium-ion rechargeable battery pack attaches to the HEOS 1 HS2 base, with easy twist-on/twist-off attachment. Listen to your favorite tracks wirelessly via the included Bluetooth functionality in the HEOS 1 HS2 - no wires needed, no Wi-Fi connection needed. The included silicone splashguard provides protection against splashing water, making the HEOS 1 HS2 the ideal wireless portable speaker for outdoor fun - use it poolside or on the spa deck with confidence. You can also listen to your favourite tracks when your smartphone is connected to the HEOS 1 HS2 and charge your device at the same time - perfect for those times when you're away from a power source and you need to recharge your phone. The USB port provides a 5V/1A output, the same as regular phone chargers.